Drs. 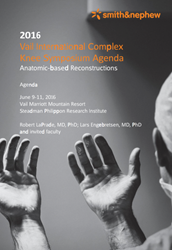 Robert LaPrade and Lars Engebretsen are set to host the 3rd Annual Vail International Knee Symposium June 9 – 11, 2016. The course will focus on the latest techniques and technologies in knee arthroscopy and the treatment of complex knee injuries. Dr. LaPrade said, “VICKS is becoming known as THE course to attend for those knee surgeons who wish to learn more about the treatment of complex knee injuries." Robert LaPrade MD, PhD and Lars Engebretsen MD, PhD are teaming up with Smith & Nephew to host the 3rd Annual Vail International Knee Symposium (VICKS) in Vail, Colorado June 9 – 11, 2016. Throughout the course, attendees will gain hands-on experience with cadaveric training and hear case discussions from leading international experts on the latest techniques and technologies in knee arthroscopy. What is Anatomic and Why is it Important? The sessions will be held at the Vail Marriott Mountain Resort and the Steadman Philippon Research Institute (SPRI). For the last 22 years, Dr. LaPrade of The Steadman Clinic in Vail and Dr. Engebretsen of the Oslo Hospital in Oslo, Norway have collaborated on over 50 studies focused on conditions and treatments of the knee. Many current anatomic-based knee reconstructions and knee arthroscopy techniques used by orthopedic surgeons around the world were designed and validated based upon Dr. LaPrade and Dr. Engebretsen’s research. For more information about VICKS 2016, please visit: Smith & Nephew Courses. For those interested in the course and unable to attend, stay up-to-date though Twitter. Please follow Dr. LaPrade on Twitter @thekneedoc and follow the event hashtag #VICKS2016. Robert LaPrade, MD, PhD is an orthopedic surgeon at The Steadman Clinic in Vail, Colorado. As the Chief Medical Officer and Co-Director of the Sports Medicine Fellowship Program at the Steadman Philippon Research Institute and treats many collegiate, professional and Olympic athletes. Dr. LaPrade has published over 255 peer-reviewed studies and has received multiple national and international research awards. Recently, Dr. LaPrade and his team published the first free iBook, “Complex Knee Surgery Made Easy” to help teach physicians around the world how to perform knee surgery.